Metronome provides a range of preset speed styles (Adagio, Moderato, etc. ), accents, output samples (drums, clapping, etc.) and even facilities for custom speed intervals and your own real-time recording. Use the metronome to practice with your own backing tracks: simply press record, play your own backing riff and then loop it. The program has been written in C, C++, and is using the timer of your system through an advanced algoritm. As a result this metronome is one of the most accurate available. This tool comes in handy for musicians or common users who want to learn to play at different instruments, while keeping a steady tempo. The user interface is clean, and you should be able to master this application pretty quickly. However, it would have been useful to access a help menu that describes the functions of each audio parameter. Metronome offers a comprehensive list with various options to choose from, as it provides 360 beats. The generated tones can differ in pitch, volume or timber, and you can also increase the tempo for each beat. You can select the number of beats per minutes from the predefined list. There are several tweaking options designed to configure the Midi device, and it’s possible to change the number of beats by selecting from various preset parameters. Metronome also allows users to adjust the volume, and to start or stop the current selection. No errors show up and the tool does not hang or crash, and it manages to preserve a good sound quality throughout the entire process of usage. 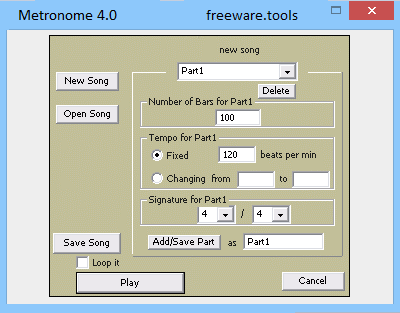 To sum things up, Metronome is a small but powerful tool that offers users the possibility to practice various beats. It can help you obtain a clear sense of timing and tempo, and also remains light on your system resources. Thanks to its neatly displayed functions, this program appeals to beginners and professionals alike.